Our mulberry juice concentrate is produced from succulent, ripe mulberries which are both naturally sweet and tart to taste. Otherwise known as the silkworm tree, the mulberry tree’s leaves are favoured by the silkworm which produces the world-renowned silk of East Asia. The berry, which is plump and dark, can be used in food colouring because of its naturally deep residue, or made into juice because of its flavour and nutritional make-up, which is rich in antioxidants. 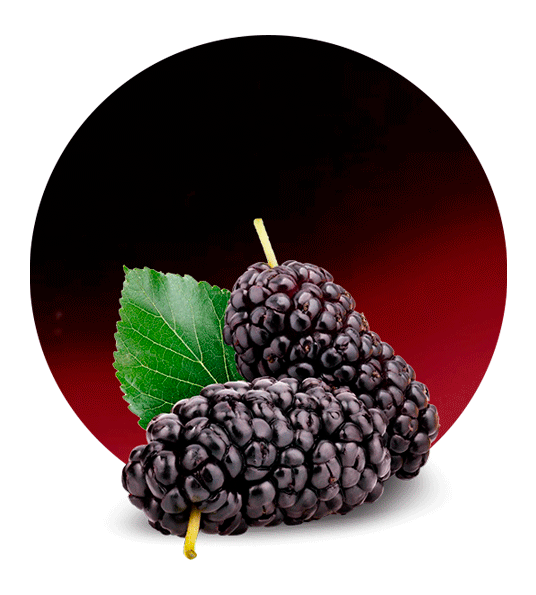 Mulberries are renowned as being one of the juiciest fruits, with their blood-like residue featuring in a number of Greek myths like Pyramus and Thisbe. Mulberry juice concentrate can be applied to a host of food and beverages, and is used in particular for the production of health bars, nutrition bars and smoothie’s due to its nutritious value. It can also be applied to pies, drinks, pastries and jellies for a deep flavour. To make a smoothie, simply add your juice concentrate to a blender with other fruits and juices (such as a banana, pineapple and apple juice) for a deliciously sunny drink. Aside from its direct consumption as a juice or flavouring, you can use the mulberry concentrate to bake a host of sweet treats, from crumbles through flapjacks. In LemonConcentrate we are manufacturers of Mulberry Juice Concentrate and we offer the possibility of supply it worldwide. If you want, you can ask for our tailored service filling the form you can find in this page. Our team will try to answer you as soon as possible. Low in saturated fat with zero cholesterol, mulberry juice concentrate is loaded with antioxidants and is high in Vitamin C, Vitamin K, magnesium, dietary fibre, riboflavin, phosphorous, magnesium, folic acid and potassium. This makes mulberry juice an excellent source of nutrients, which work to help the body metabolise fats, proteins and carbohydrates. The antioxidant value of mulberries has been known for anti-ageing in the East, and the presence of Resveratrol certainly is medically known to protect and fight diseases in the body. Mulberry juice is beneficial to the immune system, lowers blood pressure and can help regulate blood sugar, making it an all-round great addition to your diet.